Freehand exercises without the weights are resistance exercises you can do outside the gym with no equipment. Some exercises require props you can find at the park or in your home. Simple, equipment-free exercises help you to meet the fitness recommendations for healthy adults from the American College of Sports Medicine. The ACSM advises doing 30 minutes per day of moderately intense cardiovascular exercise five days a week plus eight to 12 repetitions of eight to 10 strength training exercises two times per week. Freehand exercises are calisthenics or boot camp-style exercises that require no weights or machines, are as portable as your are, and may use props you can find around your home or in the park. Rather than moving weight plates, freehand exercises use your body weight as the resistance to build your muscular and cardiovascular strength. Freehand exercises commonly target a group or groups of muscles rather than a single muscle, as you would on a gym machine. 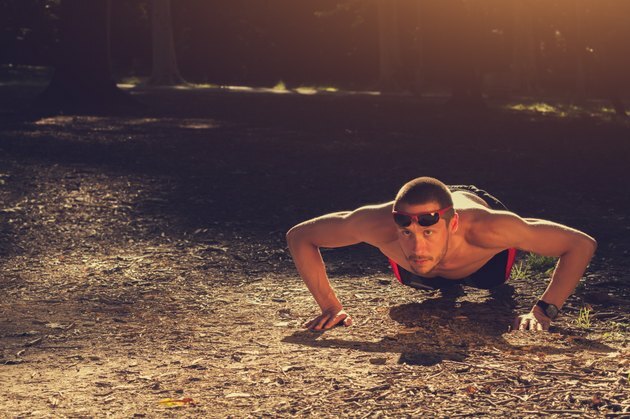 Pushups tone your upper body including your pectoral, biceps and triceps muscles. Several dynamic variations of the pushup also engage your abdomen and glutes, as well as develop your balance and boost cardiovascular fitness. Target glutes by alternately lifting one leg each time you press from the downward phase to the upward phase of the move. In the upward phase of a pushup, raise one arm out to the side and back to the floor for abs and balance. Do a squat thrust from the upward phase of your pushup to add cardiovascular exercise. Lunges are a complementary exercise to pushups and target the muscles in your core and lower body, including the power muscle groups of the legs. Use the form of a basic lunge, and then step out to the side or behind you instead. Turn lunges in any direction into step-ups – by stepping up onto a bench or low riser instead of the floor – to intensify your glutes and core workout. Dips are a freehand exercise that can require a prop. Dips target your upper body – primarily your triceps muscles – and core. Perform body weight dips with your back to your prop. Using a bench at the park or a step at home, grip it with both hands behind you to focus on your chest muscles. Do your dips between two sturdy chairs, gripping one chair on each side of you, to focus on your anterior deltoids. Do prop-free dips in either position with your hands on the floor, alternately bending elbows to do a one-handed version.